I have continued to analyze the words I have used in my artist statements over the past twelve months or so. Above is a visual representation of the frequency of use. In my last post I discussed how I had removed common words such as is, if, and so, before analyzing the text. Just as before, the larger the word is represented, and the higher in the lines it appears, the more frequently I have used that word in my artist statements. The fewer times I used a word the smaller and lower in the lines it appears. I have gone a step further and removed even more common words (they, their, etc), and combined similar plurals (piece and pieces) and some synonyms to try and see trends. There was absolutely no science involved. What do I notice at first glance? I talk about myself, I, more than you. I use the word piece and object far more than art or jewelry. In fact, only once do I use the word ring, but there is no other mention of traditional forms of jewelry. However, I do use the word form. 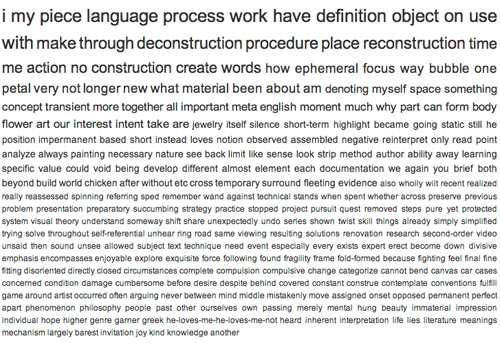 Additionally after combing all variants of these words I see that, in order of preference, I seem to like to talk about deconstruction most, then reconstruction and lastly, construction. 1018 words originally, carefully culled down to the most meaningful 667. 321 are unique.